An off-white mugful of leather-brown brew whilst waiting for the phone to ring. And then another, and another. The phone rings. Then more tea, after you’ve got the news, in a different, brighter mug this time, made of Cypriot blue-and-white pottery. What else can it be, but a crisis. Which means, of course, a whole lot of tea. When I say a lot, I mean even more than normal, which may be itself a lot, by some people’s standards. Being English, I really do opt for tea at every conceivable opportunity. So that’s tea on rainy days. Tea on sparkling wintry afternoons when the sky is ice-blue, like this one. Tea on sweltering summer holidays in Spain when you’re desperate for a cuppa to cool you down. And when you really need something to hang on to, when you’re waiting for the news to come through, or after it has come, be it good, bad, mediocre, boring or news-less news, what better than tea to pin you down and bring your hyper-active mind back to the here and now. If it’s a family drama, as it was this time, you sometimes ring the changes with sherry. Just a thimbleful, sweet but not unpleasant. Sherry occurs all the more if there are grandmothers involved. Accompanied by a wedge of heavy fruit cake studded with glace cherries, bought at the church sale the Sunday before. On a plate, with a napkin. But this week there was only tea. No cake, though there could have been. For the news was very good indeed. It always seemed too much, too much scent and wood smoke and where was the good old tannin? Until this summer, that is, when W from Brighton (she of the perfect boiled eggs), showed me the proper way to drink Lapsang Souchong. 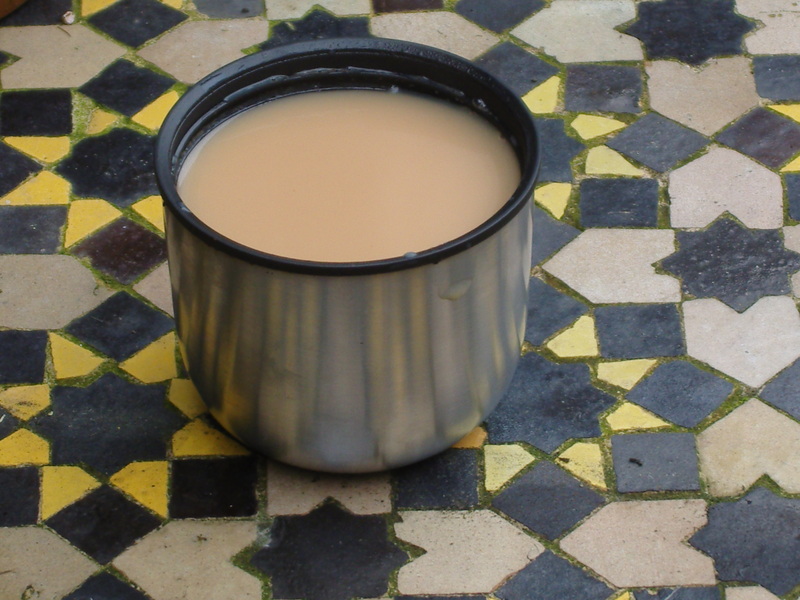 W puts two – or even three – parts Lapsang to one part English Breakfast, fills the pot with just-boiled water and leaves to brew for at least a few minutes. You need the English Breakfast to give body to the wistful Lapsang, traditionally brewed in China from leaves dried over pinewood fires. You add milk (not lemon, which works in Earl Grey but not here). What you end up with is on the one hand a dry deep tea with the requisite kick of tannin, and on the other a cup of mountain air and mists and summer barbecues, and these two tastes somehow, miraculously, married together. I’ve bought a new flask from the Turkish Discount Store at the bottom of our street – it’s between Fri-Chik and the Hoolywood Grill (sic) and its owner sits outside all day watching traffic and looking glum. Thermos flasks – along with teapots – have wedged themselves into my imagination as symbols. For what? Well, for a kind of ritualised letting go. Dothing nothing much, at least for a quarter of an hour. There’s a dreaminess that comes in those times out of time, when everything you thought you had to do seems really rather insignificant. The only truly meaningful thing to do is to sit and watch the sky, perhaps making gentle conversation or just in silence, and to sip piping hot tea. Tea tastes even better outside and that’s where a thermos really comes into its own. It means freedom. When you’ve got your flask you can go anywhere. You’re close to nature, but not so close you let go of the essentials, essentials like Darjeeling or Earl Grey.